R OBERT B URNS T HE MAN, T HE M YTH, T HE L EGEND. 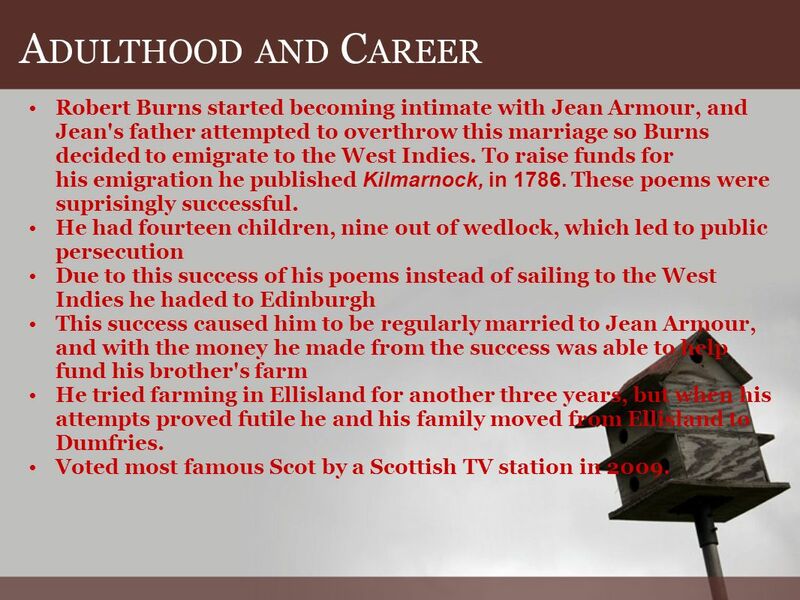 3 A DULTHOOD AND C AREER Robert Burns started becoming intimate with Jean Armour, and Jean's father attempted to overthrow this marriage so Burns decided to emigrate to the West Indies. To raise funds for his emigration he published Kilmarnock, in 1786. These poems were suprisingly successful. He had fourteen children, nine out of wedlock, which led to public persecution Due to this success of his poems instead of sailing to the West Indies he haded to Edinburgh This success caused him to be regularly married to Jean Armour, and with the money he made from the success was able to help fund his brother's farm He tried farming in Ellisland for another three years, but when his attempts proved futile he and his family moved from Ellisland to Dumfries. Voted most famous Scot by a Scottish TV station in 2009. 5 T O A L OOSE Ha! whaur ye gaun, ye crowlin ferlie? Your impudence protects you sairly; I canna say but ye strunt rarely, Owre gauze and lace; Tho', faith! I fear ye dine but sparely On sic a place. Ye ugly, creepin, blastit wonner, Detested, shunn'd by saunt an' sinner, How daur ye set your fit upon her- Sae fine a lady? Gae somewhere else and seek your dinner On some poor body. 6 T O A L OUSE Swith! in some beggar's haffet squattle; There ye may creep, and sprawl, and sprattle, Wi' ither kindred, jumping cattle, In shoals and nations; Whaur horn nor bane ne'er daur unsettle Your thick plantations. Now haud you there! ye're out o' sight, Below the fatt'rils, snug an' tight; Na, faith ye yet! ye'll no be right, Till ye've got on it --- The vera tapmost, tow'ring height O' miss's bonnet. 7 T O A L OUSE My sooth! right bauld ye set your nose ou As plump an' grey as onie grozet: O for some rank, mercurial rozet, Or fell, red smeddum, I'd gie ye sic a hearty dose o't, Wad dress your droddum! I wad na been surpris'd to spy You on an auld wife's flainen toy: Or aiblins some bit duddie boy, On's wyliecoat; But Miss's fine Lunardi! fye! How daur ye do't. 8 T O A L OUSE O Jenny, dinna toss your head, An' set your beauties a' abread! You little ken what cursed speed The blastie's makin! Thae winks an' finger-ends, I dread, Are notice takin'! O wad some Power the giftie gie us To see oursels as ithers see us! It wad frae monie a blunder free us, An' foolish notion: What airs in dress an' gait wad lea'e us, An' ev'n devotion! 11 T O A M OUSE Wee, sleekit, cowrin, tim'rous beastie, O, what a panic's in thy breastie! Thou need na start awa sae hasty Wi bickering brattle! I wad be laith to rin an' chase thee, Wi' murdering pattle. I'm truly sorry man's dominion Has broken Nature's social union, An' justifies that ill opinion Which makes thee startle At me, thy poor, earth born companion An' fellow mortal! 12 T O A M OUSE ( CONT.) I doubt na, whyles, but thou may thieve; What then? poor beastie, thou maun live! A daimen icker in a thrave 'S a sma' request; I'll get a blessin wi' the lave, An' never miss't. Thy wee-bit housie, too, in ruin! It's silly wa's the win's are strewin! An' naething, now, to big a new ane, O' foggage green! An' bleak December's win's ensuin, Baith snell an' keen! 13 T O A M OUSE ( CONT.) Thou saw the fields laid bare an' waste, An' weary winter comin fast, An' cozie here, beneath the blast, Thou thought to dwell, Till crash! the cruel coulter past Out thro' thy cell. That wee bit heap o' leaves an' stibble, Has cost thee monie a weary nibble! Now thou's turned out, for a' thy trouble, But house or hald, To thole the winter's sleety dribble, An' cranreuch cauld. 14 T O A M OUSE ( CONT.) But Mousie, thou art no thy lane, In proving foresight may be vain: The best laid schemes o' mice an' men Gang aft agley, An' lea'e us nought but grief an' pain, For promis'd joy! Still thou are blest, compared wi' me! The present only toucheth thee: But och! I backward cast my e'e, On prospects drear! An' forward, tho' I canna see, I guess an' fear! 15 T O A M OUSE A NALYSIS Stanza 1 – In stanza one Burns addresses a mouse that he sees in some heavy Scottish dialect. He describes the mouse as something that is scared. Burns then tells the mouse that he does not want to chase it. Stanza 2 – Stanza two brings a shift of dialect. Burns tells the mouse the reason that humans chase it is because we are broken away from our nature, and for this he apologizes to the mouse. Stanza 3 - The poem shifts back to the heavy Scottish dialect. Burn understands that the mouse needs to steal an occasional ear of corn to live, but it is ok because the mouse needs to live so Burns does not mind. 16 T O A M OUSE A NALYSIS ( CONT.) Stanza 4 – Burns reflects on how the mouses house has been destroyed by his own plow, and now the mouse has nothing to make a new house out of. Burns feels especially bad because it is winter so the mouse will probably die. Stanza 5 – Burns begins to describe how the mouse was once prepared for winter because it saw winters fast approach, but because of Burns plow destroying her home she is no longer ready for the winter. Stanza 6 – Burns talks about how the house that the mouse spent a lot of time making is now gone, and now has to live though winter with nothing. 17 T O A M OUSE A NALYSIS ( CONT.) Stanza 7 – The beginning of this stanza marks a shift where Burns begins to tell the mouse that he is not alone, and that foresight usually ends in vain. Stanza 8 – Burns tells the mouse that is better off than he is and that although he cannot see the future he still tries to guess what will happen so he can prepare as well as fear the parts of the future he cannot see. Throughout the poem Robert Burns develops the theme of respecting life no matter how small. A live and let live mentality.However, In the second part of the poem Robert Burns seems to develop a second theme of one can never truly prepare for the future for it is unknown. 18 What did you find? Dialect Speech characteristic of a particular region or group. 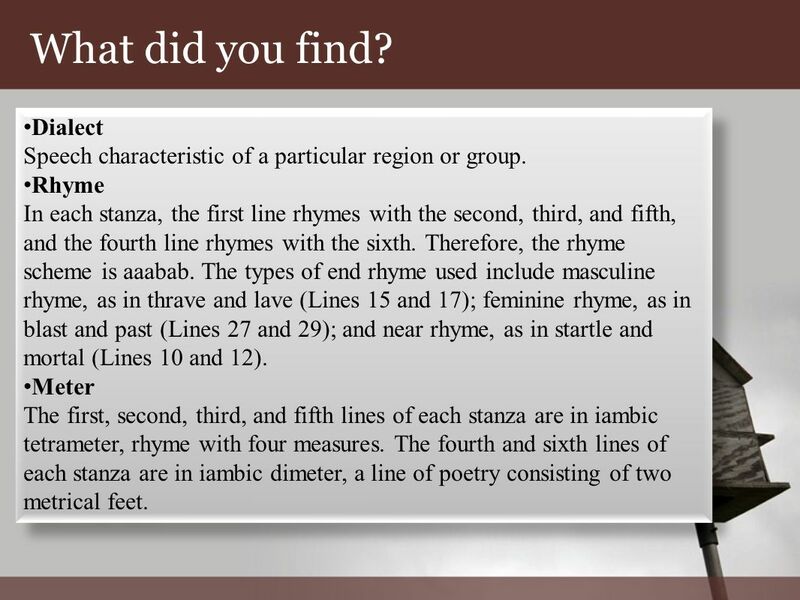 Rhyme In each stanza, the first line rhymes with the second, third, and fifth, and the fourth line rhymes with the sixth. Therefore, the rhyme scheme is aaabab. The types of end rhyme used include masculine rhyme, as in thrave and lave (Lines 15 and 17); feminine rhyme, as in blast and past (Lines 27 and 29); and near rhyme, as in startle and mortal (Lines 10 and 12). Meter The first, second, third, and fifth lines of each stanza are in iambic tetrameter, rhyme with four measures. The fourth and sixth lines of each stanza are in iambic dimeter, a line of poetry consisting of two metrical feet. Dialect Speech characteristic of a particular region or group. Rhyme In each stanza, the first line rhymes with the second, third, and fifth, and the fourth line rhymes with the sixth. Therefore, the rhyme scheme is aaabab. The types of end rhyme used include masculine rhyme, as in thrave and lave (Lines 15 and 17); feminine rhyme, as in blast and past (Lines 27 and 29); and near rhyme, as in startle and mortal (Lines 10 and 12). Meter The first, second, third, and fifth lines of each stanza are in iambic tetrameter, rhyme with four measures. The fourth and sixth lines of each stanza are in iambic dimeter, a line of poetry consisting of two metrical feet. 21 B IBLIOGRAPHY "Robert Burns - About Robert Burns." Electric Scotland Is All about the History of Scotland and the Scots. Web. 15 Dec. 2010..
Download ppt "R OBERT B URNS T HE MAN, T HE M YTH, T HE L EGEND." Hope and Dreams By Dan and Maddie. To a Mouse By: Robert Burns Chad Scott & Olivia Haag. TO A LOUSE ROBERT BURNS. To A Louse Robert Burns Chanel Mickens Uneque Belle. To a Louse Ha! Whare ye gaun, ye crowlin ferlie? Your impudence protects you sairly, I canna say but ye strut rarely Owre gauze and lace, Tho' faith! To A Mouse By: Robert Burns By: Abhishek Soma and Justin Yang. JOHN STEINBECK Of Mice and Men. John Steinbeck Born in Salinas, California in 1902  Spent the majority of his life in California  impact on his writing?